Réalisatrice, productrice, scénariste, chercheuse, monteuse et preneuse de son sud-africaine. Ancienne boursière Fulbright, Shameela SEEDAT s'est spécialisée en droits humains et bonne gouvernance, avant de devenir cinéaste. Elle est titulaire d'une maîtrise en droit de l'Université Columbia de New York. 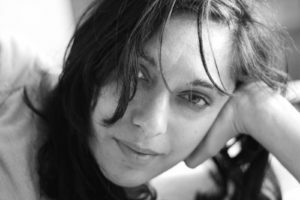 C'est en 2010 que Shameela commence sa carrière de cinéaste en tant que réalisatrice, productrice, scénariste, chercheuse, monteuse et preneur de son. Des films comme "Becoming myself" (2017), "I am woman: Lucinda Evans" (2016) portent sa signature. WHISPERING TRUTH TO POWER (2018) est son premier long métrage documentaire: il a valu le Prix Spécial du jury à Hot Docs 2018 et Luxor (LAFF 2019), ainsi que l'Etalon de Bronze au Fespaco 2019. South African Film director, producer, scriptwriter, researcher, editor and sound recordist. Former Fulbright scholar Shameela Seedat is a human rights and governance specialist turned filmmaker. She holds a Master's degree in Law from Columbia University in New York. Shameela worked for the South African Constitutional Court, the UNDP/UNIFEM in New York and the Institute for Democracy in South Africa (IDASA), and also made submissions or consulted for the South African parliament, the African Peer Review Mechanism (APRM), the United Nations Economic Commission for Africa (UNECA) and Global Integrity (GI). She has published widely on human rights and democratic accountability and has addressed the Parliament of the DRC, the UN Economic Commission for Africa in Addis Ababa, the International Civil Forum against Corruption in Indonesia and South Africa's National Anti-Discrimination forum. In 2010, Shameela turned to filmmaking; working as director, producer, scriptwriter, researcher, editor and sound recordist. She has been commissioned by various civil society institutes and televisions stations to make character-lead, human and political interest documentaries. Her director credits include BECOMING MYSELF (2017), I AM WOMAN: LUCINDA EVANS (2016), three half-hour narrative documentaries for CGTN's FACES OF AFRICA series (KHALO'S LETTER TO MADIBA, LIVING THE CHIMURENGA LIFE and MONWABISI AND THE SHARKSPOTTERS), as well as web-based films for the Heinrich Boll Foundation, the European Union and the Open Society Foundation. Her producer credits include A STORYTELLER IN EGYPT (for Al Jazeera's ARTSCAPE) and the multi-award winning documentary THE DREAM OF SHAHRAZAD. WHISPERING TRUTH TO POWER (2018) is her first feature-length documentary. Shameela SEEDAT studied law, politics and human rights at the University of Cape Town [South Africa] and as Fulbright scholar at Columbia University in New York [USA]. Over the past 14 years she has worked extensively in the field of democratic governance and social justice and built up a substantial body of work and professional network, both locally and globally. She has worked as a researcher for South Africa's Constitutional Court in Johannesburg, as a legal consultant for UNIFEM in New York and as a policy analyst at the Institute for Democracy in South Africa. Her work with UNIFEM/UNDP addressed electoral and constitutional reform in several post-conflict societies, including Rwanda, Kosovo, East Timor and South Africa. Shameela has addressed forums ranging from the Parliaments of South Africa and the Democratic Republic of Congo to the International Civil Forum against Corruption in Indonesia and the South African National Anti-Discrimination Forum. Shameela was also invited as an independent expert to the United Nations Economic Commission for Africa in Addis Ababa to give input on the design of the African Peer Review Mechanism (APRM) questionnaire dealing with good governance. She has provided numerous democracy-related workshops for politicians from African countries (including Sudan, Zambia, Botswana, Swaziland, Namibia and Angola) and published widely on social justice in various anthologies, journals and newspapers. Recently, she acted as associate producer on a film dealing with post-revolution Egypt for AJE. Former Fulbright scholar Shameela Seedat is a human rights and governance specialist turned filmmaker. She holds a Master's degree in Law from Columbia University in New-York. In 2010, Shameela turned to filmmaking, working as director, producer, scriptwriter, researcher, editor and sound recordist. Her director credits include "Becoming myself" (2017), "I am woman: Lucinda Evans" (2016).